← I’m back! And now I’m a Daring Cook! I’ve just got a quickie (harhar) for you today, because this particular recipe is certainly nothing challenging or complicated, but it is one of the most surprisingly awesome things I’ve made in a very long time. I never expected this recipe to work as well as it did, but now that I’ve tried it I’m kicking myself for not doing so sooner, and I can pretty much guarantee that this will be going into my regular rotation. Its easy, relatively fast, and pretty much guilt-free – but believe me, you’d never know it once you taste them. So what is this miracle recipe? Yes, you read that right. Sounds ridiculous doesn’t it? I figured this was doomed to fail, or to work well enough but turn out a pallid replacement for the sinful oil-fried chips we all love, whether we admit it or not and whether we allow ourselves to indulge in them or not. 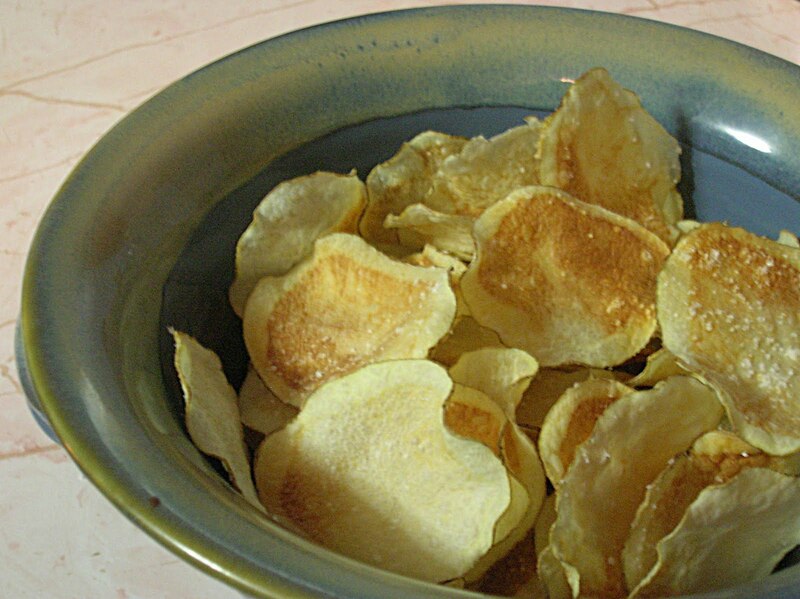 But I couldn’t have been more wrong – despite the bizarre cooking method and the almost total absence of oil, these chips came out crisp and savory and the spitting-image of full-fat chips. They’re a low-fat dieter’s dream. Crispity, crunchity, potatoey goodness, and almost entirely fat-free. Some of you may have already tried these before, and if so all I can say is “Why didn’t you tell me?!?”. But for those of you who haven’t, I implore you to do so. With one potato, some water and salt, cooking spray and a microwave, you’ll have a bowl of shatteringly crispy, salty snacks in less than an hour. I made mine based on this recipe at recipezaar.com. I used a mandoline to slice the potato super thin (Have I mentioned how much I love that tool? Perfectly uniform paper-thin slices in seconds.) and found that for the size of my slices, I got golder brown crispy chips in 3-4 minutes. With bigger slices (surface area, not thickness – you want them as thin as you can get them) it may take anywhere up to the 5.5 minutes recommended by the recipe. Just keep an eye on the first batch and see how long it takes to get your chips to the doneness you want, then use that to set up later batches. Try it. Seriously. These just might change your snacking life. This entry was posted in Food, Drinks and Cooking, Table for Two? Archives and tagged potatoes. Bookmark the permalink. hmmm i've seen mixed reviews on this method. but when the cost is pretty much <$1 for a potato what have you got to lose? maybe i'll give them a shot.